ANNOUNCING AN eBOOK THAT WILL HELP YOU CAPTURE BETTER IMAGES. AVAILABLE FOR DIRECT DOWNLOAD FROM THIS PAGE (BELOW) OR IN YOUR AMAZON KINDLE LIBRARY. The two fundamental aspects that make an image a keeper are its composition and content. This book reveals all about those aspects that the author has mastered in seventy years of photography. You will benefit from his practical suggestions, all illustrated by 178 images included in its 62 pages of useful content. And you’ll enjoy the occasional tongue in cheek approach to ideas that come from so many years of experience. The author even includes examples of his work that have composition defects and he points them out to reinforce the principles! This book is NOT a coffee table book although it’s loaded with memorable images. A pro not given to praise pronounced the images “amazing”. And this book is NOT an “overview” or an “introduction”; it’s full of specific, meaty suggestions and examples. It won’t teach you how to operate your camera; there are plenty of other ways to learn that. It will, however, teach you to select and study subjects or scenes and to compose for lasting effect. 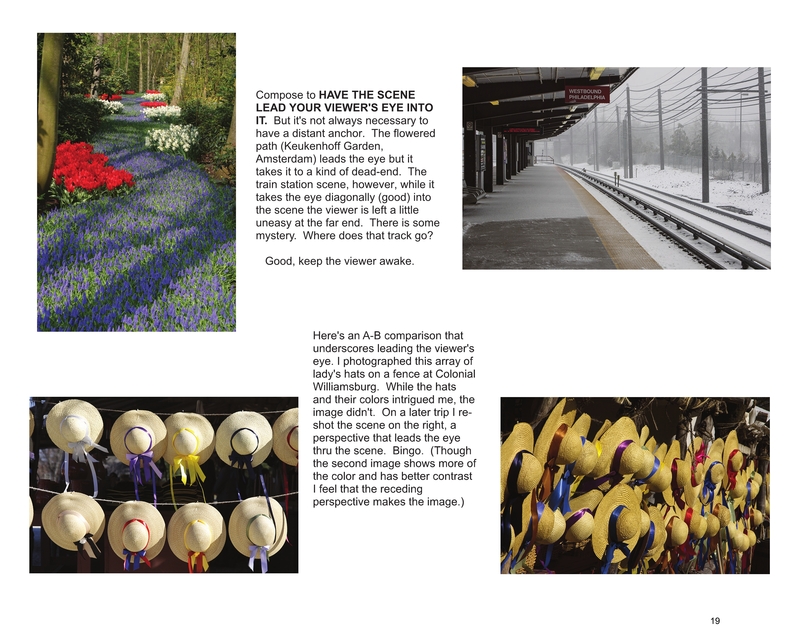 You will learn how to build an image, image construction for landscapes, the drama that lighting can add, cropping for maximum effect, and all kinds of ideas about content to look for and how to photograph it. The author refers to all of this work as “pre-processing”, the things you need to do to have keepers on your flash cards. 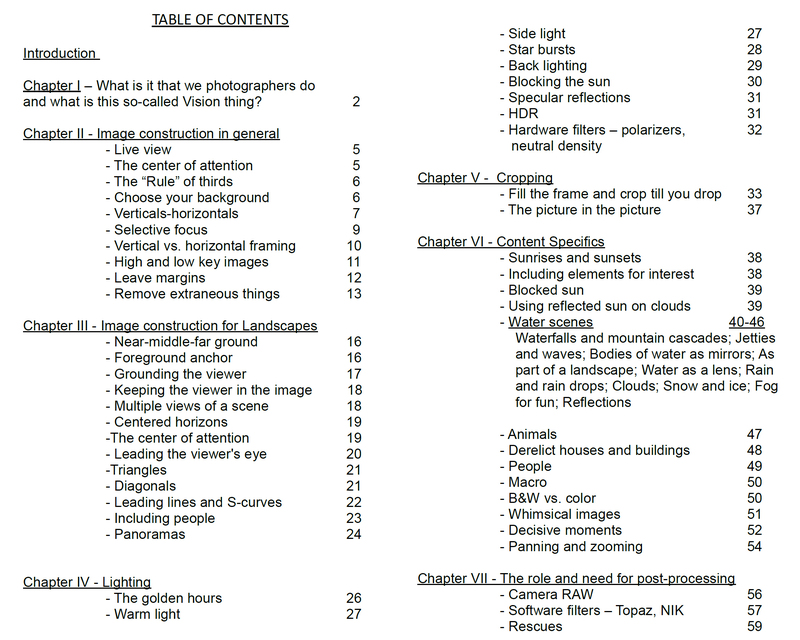 To give you an idea of the extensive content here’s the Table of Contents. Here’s a typical page showing the practical advice with the reinforcement of the related images. 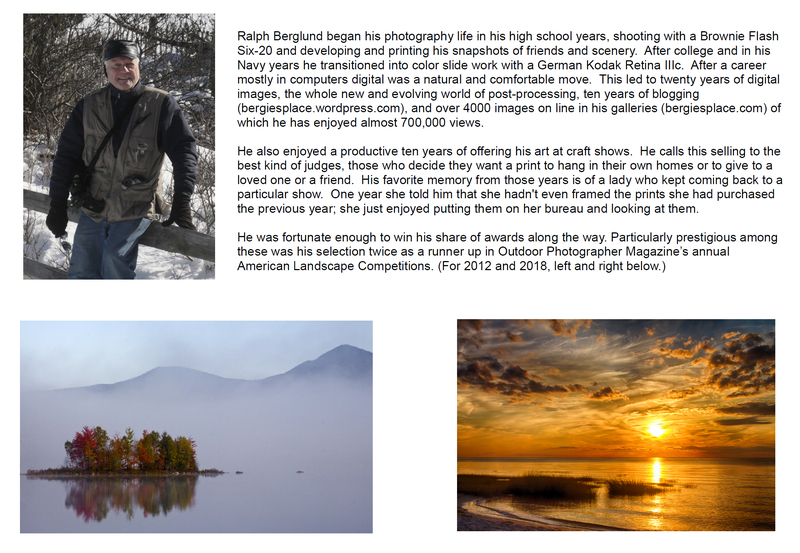 A short background of the author and his experience. Note that because of the extensive use of images for instruction the display of the book’s pages will be most effective on larger-sized screen devices such as laptops, desktops, larger screen tablets or Kindle devices. The book is only $9.95, about the price of a good glass of wine. The wine is good but soon gone; the book is yours to refer to over and over. PDF downloads can be ordered through our safe store on Selz.com for saving on your device. We accept major credit cards and PayPal. Upon receipt of your order you will receive an acknowledgement with a button to push for download. Good shooting after that. You can add a Print Replica from Amazon’s Kindle Store to your Kindle Library for a number of devices (phones not recommended).